From new quarterbacks to traditional rivalries, this fall promises to provide drama across Maine. Brunswick High quarterback Nate Girardin expected big things last season. The Dragons had rolled to an undefeated Class B title in 2016, a team so dominant it wasn’t forced to punt all season until the regional final. That’s what can happen when you play in Class B North. It was the most evenly matched division in Maine high school football last season and, coaches agree, will be equally tight this year. With Brunswick taking a huge step back en route to a 2-8 finish, a five-way battle developed for supremacy. Eventual champ Skowhegan, Lawrence and Cony each finished 5-3 in the regular season. Messalonskee and Brewer were 4-4. Expect similar parity this year – with Brunswick, the league champ from 2014-16 – rejoining the top tier. “We’re all going to be in the mix again this year in the North,” said Skowhegan Coach Ryan Libby. 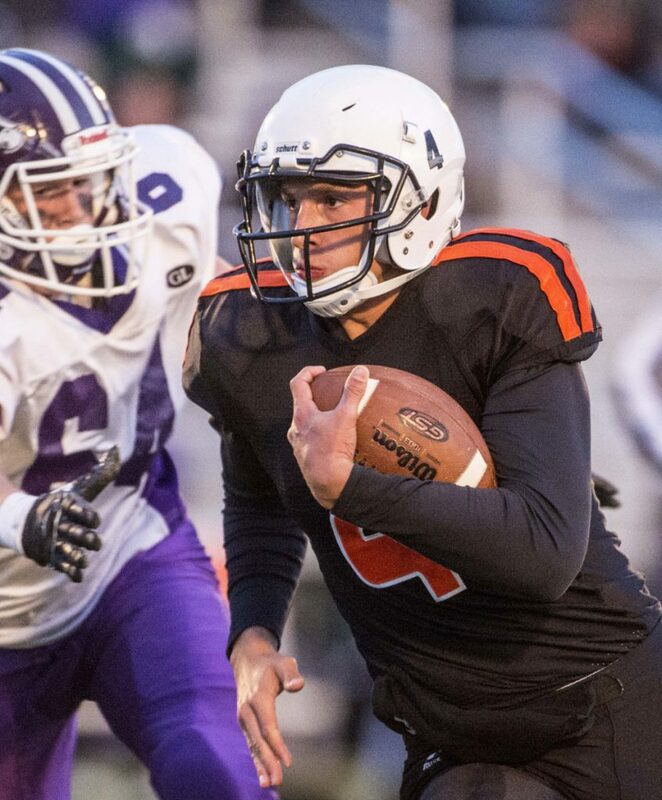 Skowhegan returns quarterback Marcus Christopher, who threw for nearly 3,100 yards last fall. But, Christopher’s top-tier receiving corps was thinned by graduation, and Skowhegan’s crossover games are against Class B South powers Marshwood and Kennebunk. Cony has power in the line, led by state wrestling champ Nic Mills, but graduated its quarterback and standout receiver Jordan Roddy. Lawrence returns top back Isaiah Schooler but is another team working in a new quarterback. “There’s a lot of unknowns,” said Lawrence Coach John Hersom. Brewer is respected as a traditionally tough program but “needs to develop in key positions,” said Coach Nick Arthers. And then there’s Brunswick. Seventeen seniors return. A strong junior class is led by fullback Owen Richardson (1,200 yards last fall). To enhance their togetherness, Brunswick’s players embraced their own version of a team dinner: Tuesday Night Wing Night, where players gorge on chicken wings. “Every Tuesday. It’s just something where everyone looks forward to going out and enjoying stuff as a team,” Bromiley said. Defending Class A champion Scarborough graduated Fitzpatrick Trophy winner Owen Garrard, All-State quarterback Zoltan Panyi and its top four receivers. So why predict the Red Storm will repeat as Class A champions? Start with big, tough, athletic guys up front and game-breaking threat Jarett Flaker (37 offensive touches, 10 TDs as a sophomore), who is almost completely recovered from a hamstring injury that kept him out of the outdoor track championships. Zach Reed and Anthony Pizzella were starters on the offensive line last year, when Scarborough steamrolled Class A in a 10-1 season. Nate Mars and Sean Shackford were defensive line starters who now will also start on offense. With either Max Piispanen or Colin Weed at center, the Red Storm offensive line will average 260 pounds. “And they’re athletes,” said ninth-year Scarborough Coach Lance Johnson. Having “football” size is one of the big differences between current Scarborough teams and Johnson’s early teams. “For a long time, Lance had a basketball team in football pads. They didn’t have a lot at the line of scrimmage,” said Cheverus Coach Mike Vance. Told of Vance’s comment, Johnson laughed. Chase Cleary, a junior who saw time as Panyi’s backup, will get the starting nod as Scarborough’s quarterback. Replacing quarterbacks is an annual theme, and this year there are significant changes behind center, including Scarborough’s top challengers in Class A South – perennial powers Thornton Academy and Bonny Eagle. Thornton Academy expected to have Will Mitchell, a strong-armed 6-foot-3 junior, back for his second season. Mitchell was 7-1 as a sophomore starter but did not play in either of Thornton’s playoff games. Mitchell transferred to Nation Christian Academy in Port St. Lucie, Florida, where he is expected to start for a fledgling football program. Nation Christian Academy’s CEO is Mike Woodbury, who formerly ran MBNation Basketball, a once-popular club basketball team in Maine. Kobe Gaudette, a 5-11 junior, started Thornton’s two playoff games, including a win against Bonny Eagle. The Golden Trojans also will be without senior C.J. LaBreck, one of the top all-around athletes in southern Maine. LaBreck was an all-conference defensive back and second-team choice at wide receiver, then led Thornton to its first lacrosse state title. LaBreck recently underwent shoulder surgery. Bonny Eagle, also 7-1 last year in the regular season, is likely to use two quarterbacks to replace Connor Sirois, who was second-team All-SMAA behind Panyi. Zach Maturo, a junior better known as a basketball player, was Sirois’ backup and has the running ability to fit into the Scots’ spread attack. Keegan Meredith, another junior, has the better throwing arm. In Class B South, Falmouth graduated Jack Bryant, a three-year starter who rewrote the team’s passing records and took the Yachtsmen within about 10 yards of upsetting state champ Marshwood in the South final. Nick Mancini, a junior, is the leading candidate to replace Bryant, and wide receiver Brady Douglas will probably take some snaps. In waiting is promising 6-2, 170-pound freshman Cooper Bush. Class C North is another division considered to have four legitimate contenders. Defending state champ Maine Central Institute and long-time power Winslow expect serious challenges from up-and-coming programs at Hermon and Nokomis. “You could put any of those other three teams in any order with us as the top four,” said MCI Coach Tom Bertrand. MCI has been to four straight state title games, the first three in Class D, where it won the 2016 championship. The Huskies return six starters on both sides, including three veteran linemen and sophomore quarterback Ryan Friend. Hermon returns its all-conference quarterback, Garrett Trask. Nokomis broke through last season with a 6-2 record but will face a stiffer schedule this season. Portland is another squad expecting to bounce back after a season of injuries. The Bulldogs return 10 starters on both sides of the ball and added transfer talent. Linebacker Grant Jacobson was a three-year starter at Windham, Tyler Blazejewski is a lineman from Gray-New Gloucester, and Ben Trefethen is a former starter at Deering. Portland’s strength should be its defensive front seven, with returning linemen Nate Kaponga and Koa Farnsworth and the linebacking trio of returner Zack Elowitch, Trefethen and Jacobson. In other transfer news, the starting quarterback at Cheverus will be Marc Reali, a junior from Biddeford who has some interesting targets in surprisingly fast 6-2, 230-pound tight end Vic Morrone and Sean Tompkins, who won the 100- and 200-meter Class A outdoor track titles. Cape Elizabeth and Leavitt are the consensus co-favorites in Class C South, with Gardiner lurking right behind. Success in crossover games could be a difference maker. Cape will play at Class D champ (and preseason favorite) Wells in the second week of the season and hosts usually gritty Class B Greely in Week 4. It’s the third straight year Cape has traveled to Wells in the regular season. The Capers won 13-7 in 2016 but lost 14-7 last season (Wells also won 27-14 in the 2016 Class C South final). Gardiner will go against Class C North power Winslow and Class B Cony, which it upset last year. “We kept Cony on the schedule because it’s a nice rivalry, and last year it was really competitive and we beat them, and despite our record (3-5) it helped us with the Heal Points and we ended up hosting a playoff game,” said Gardiner Coach Joe White. Leavitt is staying within the Class C ranks for its schedule, but that doesn’t mean its task is easy, hosting MCI (season opener) and Nokomis. Roster size will continue to be a topic of discussion among coaches, fans and media, as dwindling numbers are hitting programs at all levels. Cheverus, for example, has 34 players. “Five years ago we had 67,” Vance said. Greely Coach Dave Higgins has dealt with low turnout for years, but having only 22 players is a huge disadvantage in a league that includes Marshwood, Kennebunk and Biddeford. In Class B North, 15 of Messalonskee’s 32 players are freshmen. Traip Academy intends to play a full Class E schedule after forfeiting six games last season, but first-year coach David Bryant’s “hard-working committed group,” numbers less than 20. “I guess my most worrisome thing lately is we’re starting to hear numbers dropping, and it’s not just Class D but across all classes,” said Wells Coach Tim Roche, who has a 44-man roster.